Includes a known blood standard to monitor results. 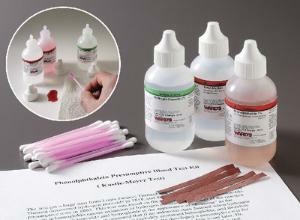 Save time in laboratory experiments using the premixed chemicals and plastic dropper bottles of liquid reagents in this kit. Everything you need for the presumptive determination of real animal blood is included in a plastic storage case, with enough materials to conduct 30 tests. Note: The phenolphthalein test will not distinguish between human and animal blood. Further serology analysis is necessary.